Get ready for a dramatic eye look! Somewhere between seasons 10 and 15 of "The Bachelor," fake eyelashes graduated from Halloween costume accessory to makeup bag staple. Reportedly, though, they've been around since 1899, when women were sewing them on with needles. These days, we don't have to go to such lengths: It's just faux hair and glue. I've never worn fake eyelashes, because personally, I like a more natural look. Still, sometimes I dream of my lashes looking as dramatic as they did when I was a kid — too young to appreciate them. Since that dream hasn't come true with drugstore mascaras, I recently decided to try Amazon's best-selling fiber lash mascara. Until a few weeks ago, I'd never heard of Mia Adora. 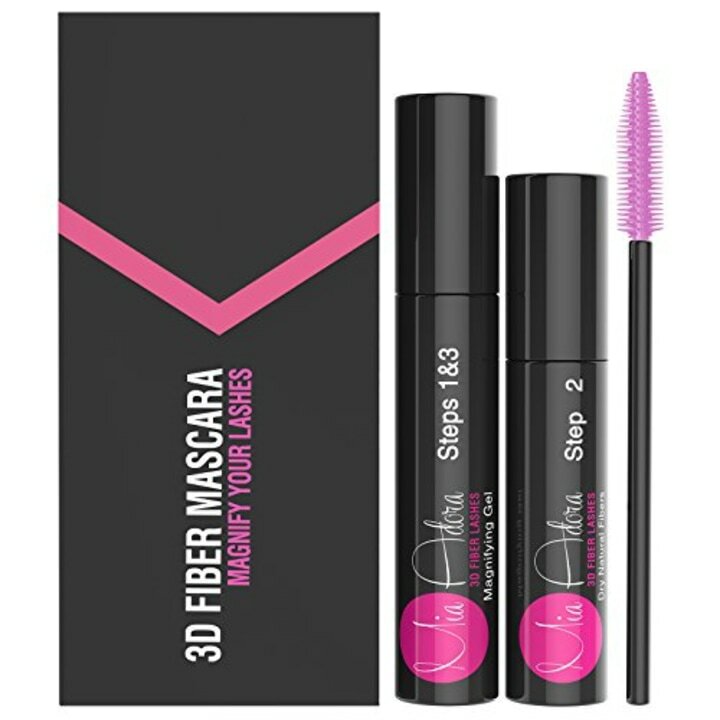 Not only is the 3D Fiber Lash Mascara by Mia Adora Amazon's best-selling fiber lash mascara, it's also Amazon's seventh best-selling mascara overall. The $20 product makes a pretty bold claim: to "build lashes by up to 300%." It's easy to be skeptical, until you read the more than 5,000 reviews behind the four-star rating. What's the difference between an amazing $7 drug store mascara and a $20 3D fiber lash mascara? For starters, this one is an entire kit. The cute satin-lined box contains a tube of magnifying gel, a tube of fibers and an eyelash comb. The nontoxic, paraben-free magnifying gel is made of beeswax. The fibers are natural green tea microfibers. Both the gel and the fibers are hypoallergenic. I've accidentally gotten a few fibers in my eyes without noticing any redness or irritation. Probably the most important contents in the kit are the instructions, since it's a three-step process. First, you apply one coat of gel, followed by a coat of fibers and, finally, another coat of gel to seal them. I wouldn't advise trying it in the car. I know, we've all been there, but applying this mascara requires time — about 45 to 60 strokes total per eye, plus the 20 seconds of drying time in between coats — and attention. The only place I put it on is in the bathroom, at home. Most reviewers recommend practicing the application for best results. Even if you're a makeup artist or the lash whisperer, it's impossible to not get clumps of fibers caught in your lashes. But that's where the eyelash comb comes in handy. Warning, though, eyelashes often fall off while declumping. I probably lose a few eyelashes every other time I wear this mascara (about twice a week). I wear it only once or twice a week, but seeing my finished lashes feels like how I feel when I first see my hair after a blowout. I've probably never achieved the 300% bigger/longer/thicker lashes Mia Adora mentions. But that might be because I complete the mascara application process only once. Some reviewers repeat the process up to five times! Sometimes my lashes, with the help of the fibers, brush against my brows. I never get that kind of length with a normal mascara. While many reviews mention the fibers falling off or being messy, mine stay on pretty well throughout an eight-hour day. As a precaution, every hour or so, I run my fingers above my eyelids and below my eyes to pick up any stray fibers. This mascara doesn't look perfectly curled and uniform like the fake lashes my friend Jenni wears. But my mascara doesn't need to bring all the boys to the yard. I just want it to bring back the look I rocked as an 8-year-old with full eyelashes. I haven't been able to achieve the look with drugstore mascaras. Fortunately, though, I've discovered the magic of 3D Fiber Lash Mascara by Mia Adora. If you need me, I'll be in the bathroom with a wand in my hand.